We recently supplied an upstart hydroponics farm in Santa Rosa, California with a large quantity of PVC gutters. When the customer called, he wanted just gutter, connectors, and plastic gutter guards to go on top of the gutters. He had no need for hangers, downspouts, and end caps — critical elements for installing PVC gutters on a home. Once I got to know him a bit, I asked what he was planning to do with the gutters, and he told me that he is going to grow tomatoes in them. While I am familiar with the concept of hydroponics gardening, I was curious to learn more, so I began exploring online, surprised to find that people all over the world are growing things in gutters. Gutters are such a great place to grow stuff we don’t want, so it’s no wonder that they’ve been adapted for food production. If you’d like to read more about this operation, Vertical Harvest, select the following link: http://bit.ly/aiIeXl. 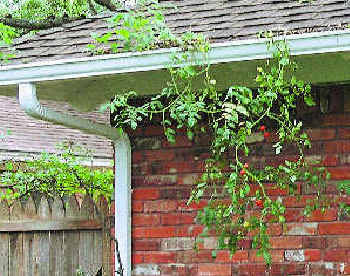 While researching the topic, I found an article in the Dallas Morning News from October 2009 that highlighted how a local resident — who had neglected her own garden — was surprised to find a large tomato plant growing in her gutter. I’ve included a photo and a link to the story if you want to read more @ http://bit.ly/bvTgPw. Hydroponic gardening is opening an entirely new market for gutters and food production, and depending on which side of the gutter you’re standing, it’s either time to embrace it or scoop out the debris and cover up! Previous story Spring is here. We want to hear from you.